At the reception, you’ll find all the useful and tourist information you need! You can buy tickets for leisure park Nigloland, but also souvenirs and postcards! Wi-Fi internet available on the entire campsite! 30 minutes for free every 6 hours around the main building. You can buy internet tickets by connecting to the Wi-Fi network or by asking at the reception. A computer is available at the reception. Kawan Resort Le Lac d’Orient offers a wide range of facilities and services, designed to make your holiday as pleasant as possible. Around a small square, you’ll find a restaurant, bar and grocery shop. The campsite restaurant will offer simple snack meals, grilled meat, pizzas and salads, and will introduce you to the local gastronomy! You’ll also appreciate having a drink out on the terrace of the bar! Besides the basic food products, fresh fruit and vegetables as well as hygiene products, the grocery shop will also offer bread and pastries. You’ll find barbecues to hire at the grocery shop. 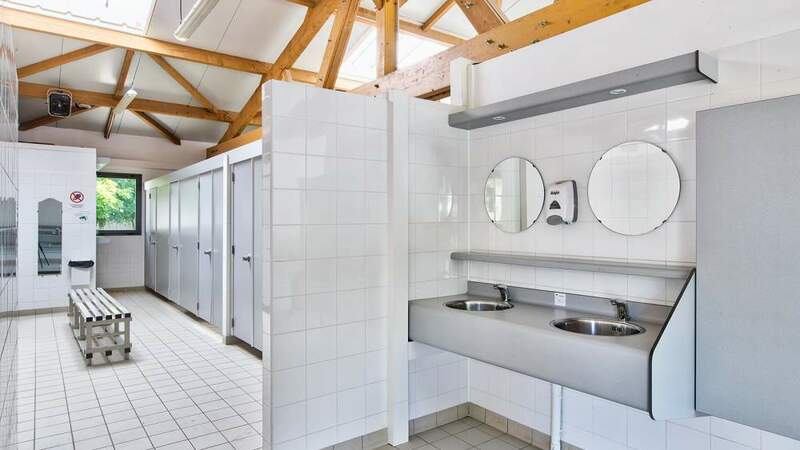 Camping Le Lac d’Orient boasts ultra-modern sanitary blocks, including one heated block. The sinks are stainless steeled and the showers are equipped with a presence detection system. One area is fully dedicated to babies (bath tubs, changing tables) and adapted to children (children sized showers and toilets). Designed to their size! You’ll also find disabled access toilets, showers and washbasins. The launderette next to the grocery shop, open 24 hrs per day, is equipped with washing machines and a tumble dryer. Tokens for sale at the reception and at the shop (5€ per token, washing powder provided). Next to the small sanitary block you’ll find a camper van service point to empty your chemical toilet. Campers can use a selective waste sorting area. Containers can be found behind the slides at the pool.